ISIL uses terror to set people against one another, so by that standard, its attack on Iran may be more successful than the ones in Britain. The terrorist attacks in Tehran on Wednesday, claimed by ISIL (ISIS, or Daesh), quickly became a Rorschach test in which observers saw what they wanted to see. President Trump immediately blamed the victims. The hard-liners in Iran blamed the Saudi Arabian royal family. ISIL uses terror to set people against one another, so by that standard, its assault on the Iranian parliament and on visitors to a shrine to Ruhollah Khomeini, the founder of the Islamic Republic, may prove to have been much more successful than its recent strikes in the United Kingdom. 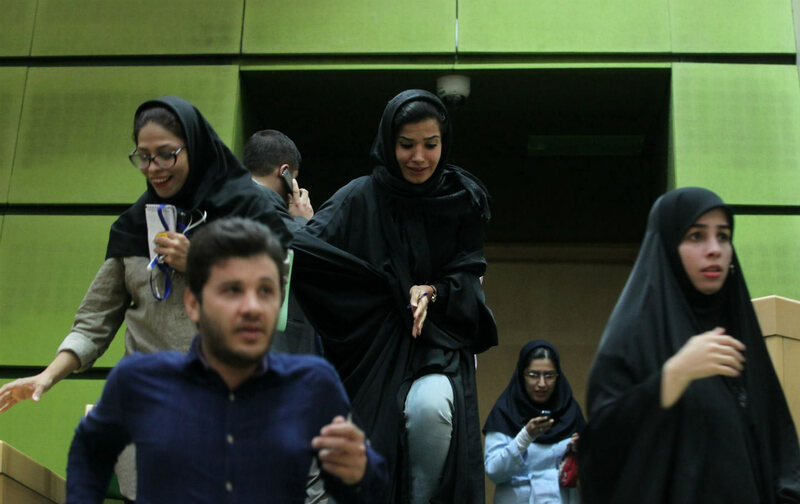 The assaults came after Iran’s successful presidential election, won by the centrist incumbent Hassan Rouhani, who is seeking better relations with the West. President Trump managed to blame the victims, issuing a statement that said: “We grieve and pray for the innocent victims of the terrorist attacks in Iran, and for the Iranian people, who are going through such challenging times,” but then adding, “We underscore that states that sponsor terrorism risk falling victim to the evil they promote.” He would have been better off saying nothing, from a diplomatic point of view. Washington demonizes Iran as a supporter of terrorist groups because of its backing for Lebanon’s Hezbollah, which has primarily functioned as a national liberation movement and more recently has fought Al Qaeda and ISIL (as well as some less radical rebel groups) in Syria. None of the terrorist assaults in the United States or Western Europe in recent years have been linked to Iran. Also on Wednesday, the US Senate voted to place more stringent sanctions on Iran. The militants launched two simultaneous operations, an old Al Qaeda trademark. In Tehran, four gunmen slipped into the Iranian parliament building and opened fire. One of them appears to have detonated a belt bomb. Iranian security forces killed all four of these attackers. At the other site, two assailants, one of whom set off a bomb, targeted pilgrims to the shrine of Khomeini, which draws hundreds of thousands of visitors a year. The death toll rose on Thursday to 17, with over 50 wounded. An Iranian national-security official is said to have identified the attackers as Iranians of Arab ethnicity. ISIL issued a video of the strike on the parliament, in which one of the operatives could be heard saying in Arabic, “Praise be to you, Lord!” and then apparently addressing the Iranians, “Do you think we are leaving?” The majority language in Iran is Persian, which is distantly related to English. An official on Iran’s National Security Council is said to have identified the attackers as Iranians of Arab ethnicity. Iran, with a population of some 80 million, has about a million and a half Arab citizens, but about half of them are Shiites. The small Sunni Arab minority has occasionally been restive. More important have been the much larger Kurdish, Baluch, and Turkmen Sunni populations. Sunni Muslims account for some 5–10 percent of the Iranian population. ISIL fighters derive from the Sunni branch of Islam, but their murderous ideology contradicts key tenets of the Sunni tradition. Strongly Shiite Iran is giving help to the fight against ISIL in both Syria and Iraq. This ISIL strategy of promoting sectarian hatred is unlikely to be fruitful in overwhelmingly Shiite Iran. The video released of the parliament attack by ISIL shows one of the terrorists saying, “Oh, Sunni people in Iran, don’t you feel the pain from those shackles that are tied around your wrists and ankles?” He called on them to launch assaults on Shiites wherever they gathered. This ISIL strategy of promoting sectarian hatred is unlikely to be fruitful in Iran, since the country’s urban populations are overwhelmingly Shiite, while the small Sunni populations live in distant rural provinces. The Sunni Baluch terrorist organization, Jundallah or the Army of God, has carried out several operations over the past decade, including mosque bombings and assassinations, but has been less active in recent years. Iran’s national guard, the Iranian Revolutionary Guards Corps, which vowed to roll up the terrorist cell that committed the attack, said that reactionary, terrorist-supporting regimes in the region were behind it. This phrase referred to Saudi Arabia. Saudi Foreign Minister Adil al-Jubeir strenuously denied the accusation. In a phone call to the Emir of Qatar late Wednesday, Trump seemed to back off his harsh condemnation of Qatar. Iranian suspicions of Saudi Arabia’s intentions have been raised not only by the blockade of Qatar but also by statements made in the past month by senior Saudi officials. Foreign Minister Jubeir said Tuesday that “Iran must be punished” for its intervention in the region. Iran’s backing for the governments in Baghdad, Damascus, and Beirut have led to the defeat of Saudi clients in those countries and weakened Saudi hegemony. Intentionally or not, those words took on a sinister cast as of Wednesday’s sanguinary onslaughts.